Arsenal manager Arsene Wenger wants better drugs-testing in football and has called for blood tests to be taken as a matter of routine. The Football Association has asked Wenger, 66, to explain comments he made about doping in an interview with French newspaper L'Equipe. The Frenchman said: "I am open to talking to the FA, of course. I want deeper, better tests because what we test is superficial. "We have to tackle these problems." Dinamo Zagreb midfielder Arijan Ademi failed a drug test following September's Champions League win over Arsenal. 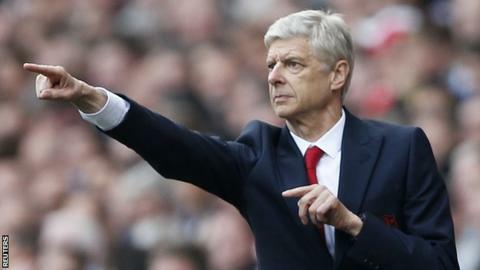 Speaking before Saturday's Premier League match with West Brom, Wenger said it was naive to think that football did not have the same issues with doping as other sports. He said: "You see the doping problem has suddenly turned up in track and field as well, we have a problem in cycling and then to think that we in football are immune because they are football players is absolutely wrong. "When people are caught they need to be punished and the clubs punished as well. Because it's a little bit unreasonable to think just because we are football we have no problems with it." Wenger also wants blood tests introduced, as urine samples are insufficient and inefficient in his view. "Today, when you play away in the Champions League, most of the time we lose two hours when there is a doping control because people cannot fulfil the [urine] tests," he added. "It's simple. Why can we not do it? In the other sports they do it."